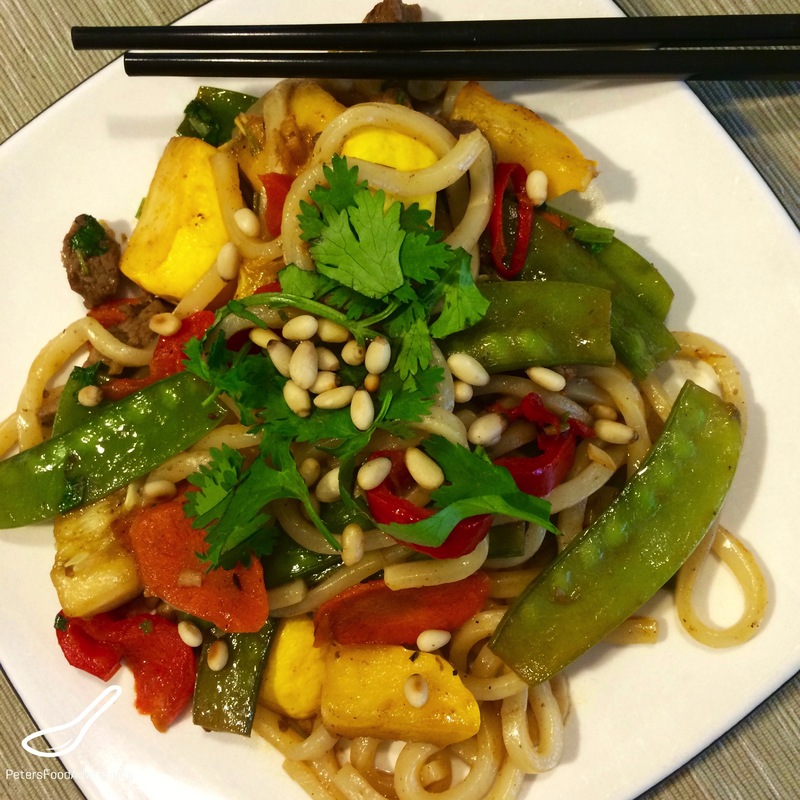 Pattypan Squash Stir Fry is a great tasting, vegetable rich noodle stir fry recipe. Sometimes stir fry recipes can start to taste the same, with the same flavours and same vegetables. I love to add interesting vegetables to my stir fry recipes and experiment with flavours. My Summer Squash explosion is still continuing in my garden, and I’m always finding creative ways to create summer squash recipes. And I’m still confused what to call my Summer Squash, specifically the Pattypan. It has so many names. The most common type of Summer Squash is Zucchini, followed by Pattypan Squash, which is my favorite. It looks like a flying saucer from a bad 1950’s movie, and comes in a variety of colours, yellow, white and shades of green. According to Wikipedia, the Pattypan Squash is also known as a Button Squash, Scallop Squash, Sunburst Squash, Granny Squash, Custard Marrow, Custard Squash, Ciblème in Cajun French, White Squash, and Scallopini. So I have so many of these growing in my garden, they are so delicious and healthy too! I let them grow much larger than the tiny ones the store sells. If you are buying them, then instead of cubing them, maybe just cut them in half or quarters, depending on how small they are. 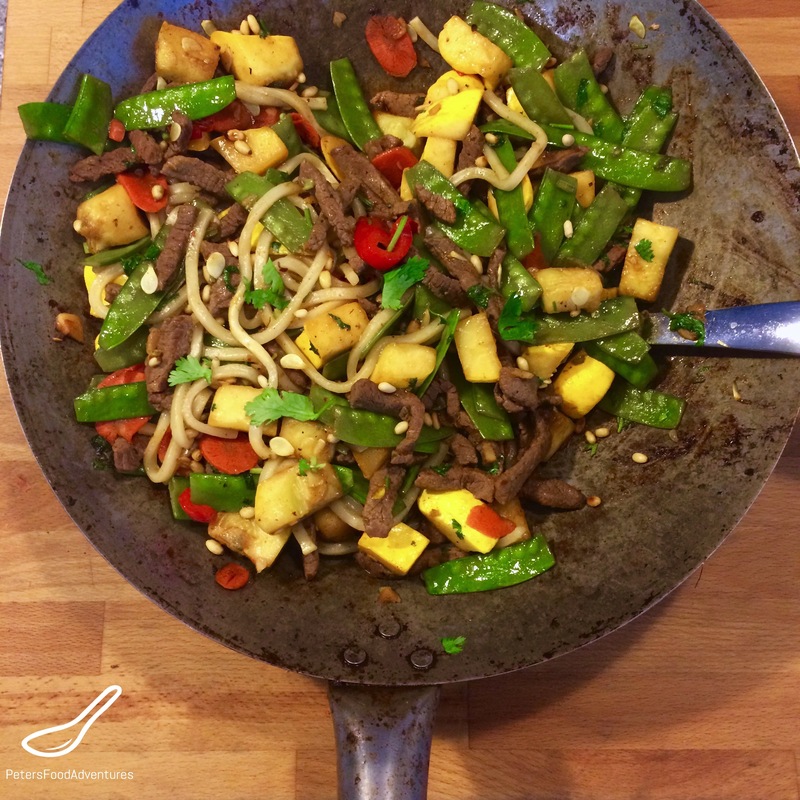 Stir Fry’s are an amazing way to get your kids to eat vegetables, and a good way to clean out your fridge and garden. This summer squash recipe has an Asian influence (not a Chinese stir fry) as it has different flavours/influences from different Asian countries. The Chinese contribution to the recipe are the Sichuan Peppers as they add a depth to the beef marinade. Sichuan Peppers aren’t spicy and are actually a dried berry. You can omit this if you don’t have them available. I love wide noodles and especially Udon Noodles (Japanese). They remind me of Chinese hand pulled noodles that my mum used to make when I was a kid. We called it ‘тянутый’ noodles in Russian which means ‘pulled’ noodles. The whole process of making Lagman Stir Fry is a very interesting process, but Udon noodles are readily available here. I hate the Udon Noodles that aren’t refrigerated, just sitting on the supermarket shelf. When you open them, they have a chemical smell and taste that I can’t shake. I’ve been lucky to find fresh Udon Noodles, in a frozen pack, which remind me of the hand pulled noodles, without the work! This is one of my favorite Summer Squash recipes. Summer Squash Stir Fry is so colorful and the flavors go so well together, especially the toasted pine nuts. And a delicious way to eat Summer Squash, I mean Button Squash, I mean Pattypans… Bon Appetit! Приятного аппетита! Marinade meat for at least 15 minutes in the Soy Sauce, Shaoxing and Sichuan Peppers. Set aside while you prepare the vegetables. In a Wok over high head, add 2 tablespoons of oil and fry the beef until the water has cooked out. Remove and set aside. Add 2 tablespoons of oil to the wok and fry the Ginger, Garlic and Chilli Pepper together until fragrant, about 2 minutes. Add sliced Carrots and Button Squash and stir fry together for about 5 minutes. Add the red Capsicum and Snow Peas, Sweet Thai Chilli Sauce with lime juice and zest, and 1 tablespoon of Soy Sauce. Stir and cook until Squash is warm but still crunchy, not soggy. In a frying pan over medium heat, toast the Pine Nuts until they are lightly golden and fragrant. Don't burn them as they toast quickly. Add in the beef, Coriander and toasted Pine Nuts and mix together. Add the Udon Noodles into the wok with the vegetables and stir until fully combined. Garnish with Coriander and Pine Nuts to serve. Great ideas for Asian fusion! Looks soooo colourful and yummmm???? Thanks Neethu! I love the colours too! Makes it look tastier! Thanks! It’s very colourful, which makes it more appealing!